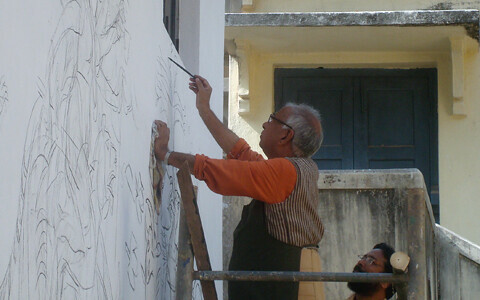 If reports are true, artist KG Subramanian is working on a new mural within the premises of Kala Bhavan campus in Santiniketan. He has already done two murals before, one over the other, on the same walls. KG Subramanian’s murals in Kala Bhavan are, in spirit, a very successful balance struck between the playfulness achieved in his drawings and sketches and the measured, if a little cadastral, spatial arrangement of his paintings. They simmer with the narrative energy of old fables with the scope of epics. Working with traditional motifs, he turns the lens of narrative traditions back on itself with clever and conscious interventions. 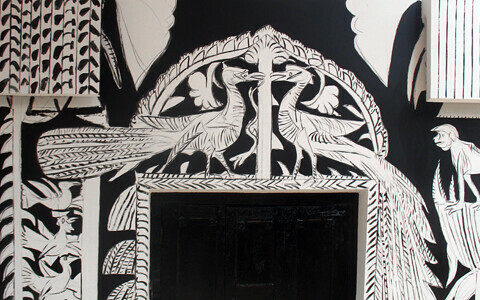 His interventions, often involving witty reworking of traditional motifs which have gained some kind of iconic condensation of forms over the years, show how he sees himself in respect to traditions he has chosen as his fictive wells of past and allows himself to draw from: he will never portray two peacocks perching on an arch facing each other (a typical ornamental trope in traditional decorative arts, often functioning as a symmetrical frame-formation device) – he will make sure one of them is a peahen, a female, to animate such iconic formations with some purpose, breaking the symmetry of decoration and making space more painterly, as well as giving it a life by turning a decorative motif into a potent narrative-propelling image, recharging old forms with a renewed sexual and narrative energy. His existing mural in Kala Bhavan is full of such beautiful moments. 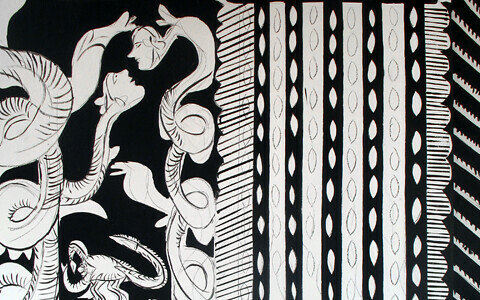 Yet, on another level, KG Subramanian’s murals function as rhetoric, where the five Aristotelian canons are held paramount – invention, arrangement, style, memory & delivery (often overlapping) – and performance is crucial: the final standing work is, as it were, merely a record of the performance. He is willing to erase his murals and re-perform. His ‘performances’ have been avidly followed, and vividly documented in photographs and films and often presented in sequential manner showing progress in stages. This time however, he has chosen a different mode. Tiling is not only a more permanent medium, it is more premeditated, with tiles arriving in numbered sequences worked out in the studio. And given the conditions, he is also not likely to do the masonry himself. But what surprised me was not the shift in mode or scope, but his choice of the site of the work: the building commonly referred to as artist Nandalal Bose’s studio (the first office-building built in Kala Bhavan, and currently serving as the office for the Art History Department). The architecture is attributed to Suren Kar, and it is a perfect example of the so-called Santiniketan style of architecture developed by the likes of Suren Kar, Rathindranath Tagore & Nandalal Bose through years of unattributed or collective meditations. 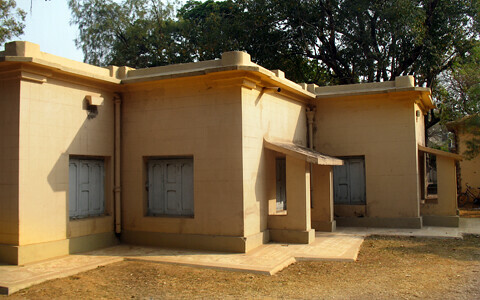 Nandalal Bose’s studio, Kala Bhavan. It is also, sadly, probably the only structure in Kala Bhavan which can be described as sort of a masterpiece in itself: it cannot be extended or done over without ruining the very logic of the structure, if one has any regard for the logic therein, that is. Its symmetry and isometric contours draw a perfect closure to itself, forbidding extensions. Its sound height-to-width ratio lends itself a delicate weight – a weight and a feel that can be easily destroyed by any material tampering. It is colored, in the austere tradition of Santiniketan, a pale, almost etiolated yellow – somewhere between a fleeting flavescent and an old wan mustard. There is almost a Haiku-like austerity about the whole affair, and that is what makes it so quintessentially a product of a certain brand of imagination we have come to associate with Santiniketan and its early builders. What it really needs is, not colored tiles, but some care, some sound renovation that will restore the structure back to what it was by doing away with the careless unconcealed wiring and patchy details that have been added later rather thoughtlessly. Even without the history it bears, it’s a beautiful building. It may not be as flashy or decorative as Subramanian imagines it, but austerity can be a virtue sometimes. The mere thought of it going under the mason’s spatula with colored tiles to be slapped on it stirs a little sob in the nerves of your average history-watcher in me. And it’s a gesture which, I wouldn’t call mindless, but mighty difficult to arrive at an understanding of the purpose of from a strictly Cartesian point of view. But it has me conflicted as well. Maybe I am wrong. When a graffiti artist is hunted down charged with vandalism for smearing a wall, we know where our sympathy lies. But there’s also something touching about the desperate inscriptions on Stick-No-Bill walls, on the concrete pages of public lavatories…and on the walls of heritage sites too, monuments proclaiming the might of the high of yore. These inscriptions, marks, are also history, something tells me, a history written in form of interjections, with lipsticks and the desperation of pocket knives. This is also history: a record of people’s desires, but people who count for nothing. In this light, maybe Subramanian should be allowed to project his desires on these austere and history-loaded walls without interruptions or unqualified dissensions like this one you are reading. And in the fashion of KG Subramanian himself, his writings, the argument can be reduced to the question of the idea of tradition & human nature itself, and no less. But then, if that is the case, my confused morals inform me, these walls should be open to others too with similar (maybe less qualified) desires. Should heritage sites be opened for public inscriptions? Whose walls are these? This is a difficult question I suddenly find myself secretly divided upon. I am in no hurry to chance upon an answer, or a solution, frankly, and not that I think I am capable of producing one. And not that it would matter, anyhow. Let the answer be born through layers of action…and remorse. Very well written and I completely agree with you. I appreciate your critical intervention. Perfect. I do subscribe to the dissent above. It is shocking to hear of the new plan of action by everyone's dear Mani da. There is definitely that 'sob in the nerves' knowing that it is this most austere building of Santiniketan that is being beckoned for a make-over. The idea of a renovation for general practical problems seems much more viable than this! Very important argument. I do agree with you. It is indeed a serious matter. I remember another attempt to do Black & White motifs (like the Design department mural by Mani da) on the same building some 8/9 years back (probably before Nandan Mela). I dont remember how and who had taken the initiative. But after a month or two the original colour was restored. Would someone know details about that project? I seriously doubt the veracity of this news. K.G was once asked by a leading light of Kolkata art circuit whether he was willing to work on a mural in a building specially designed for it and he replied in the negative: a well designed building would not need his intervention he felt. The building he chose to work on is arguably one of the ugliest buildings in Kala Bhavan complex. So I find it difficult to believe that he would do something on 'mastermoshai's studio'. A very significant point raised. 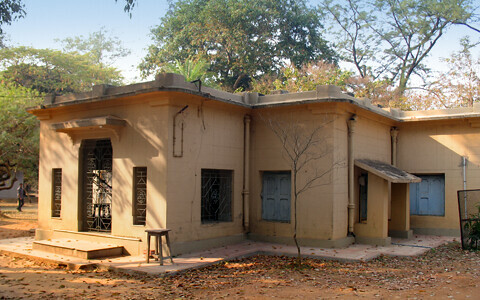 Looking from a slightly different angle, this particular building is probably the only relevant building in Kala Bhavan, Santiniketan whose walls are bare, in the sense that nothing has been imposed on them. All other walls of relevant buildings are decorated in one form or other. It may be a good idea to keep it just like that as a respectful deviation from the common practice. By keeping the walls bare as it is now, would keep a well deserved contrast alive. I am confident that Mr Subramanyum will change its mind against the present plan once he comes to know that it is being identified as one of heritage buildings due to its immense significance along with Santiniketan Griha, Upasana Mandir and many others by Visva Bharati. thank you for your such a thought provoking writing. in my mind the "mastor mashai studio" always appear with its bare walls and the patches of shadows of leaves in the afternoon light. this is my sentiments that i would like to caress like many others. but if i look at the history it has been always overwritten. ajanta was painted over more than 500 years. most of the monuments we see today had been destroyed/ rebuild several times. but i am also aware of the fact after the modern era we have developed the idea of "preserving the History"(with authenticity)as it is. but does it really matter? I very much hope with some others that this is a rumour. in response to Mahan j dutta- i feel it does matter. If for nothing else, the preservation of the original would serve as a textbook example of a certain kind of architecture- which is reason enough to retain the original concept. I am afraid the news is right- i have seen the model of the building with the layout in progress or maybe, even irrevocably, finalized. A very well-written article. I was hoping that it is rumour but it doesn't seem like :( I would love to see the building restored and not transformed, in fact a lot of the heritage buildings like this, at Shantiniketan, need preservation. As the previous responses confirm the initiation, I am in no good mind to appreciate it. But I am keen to know the reason behind the intervention on Mastermoshai's studio as it is already an unique structure in itself. These walls contain history that needs restoration and archiving, not decoration. on behalf of all the students of Acharya Nandalal Bose I request Kalabhavan Authority to stop decorating Master mosai's studio by one---however famous artist he is:after all a teacher is the inspiration of all his disciples,direct or indirect. Thank you for the very well-articulated points made and the beautiful shots of the building. I do see the marks on the walls :( . How or where can the ex-students and others concerned -- make a petition/write and voice their opinion/make a request, beg, plead ... whatever it takes? Visva Bharati? If so, Who exactly at VB? Kala Bhavana Principal? Has anyone written to Mani da himself? Is there a deadline by when it needs to be done in order to stop this from happening? It's one of the most bizarre and disturbing news to have come from KB! @Sudeshna Sengupta: I am glad you said that. I think this blogpost has served its purpose...and after discussions and arguments, we have gained valuable insights and are more aware of the nuances involved that take us beyond the scope of this simple article...I think someone should open an online forum (or a facebook page?) devoted to Mastermoshai's Studio and its future, where the discussion can be carried out in a much more open fashion...This blog is of course not ideally designed for that, I am afraid. This evening I have talked to Rishi-da (Borua) about it, and he says that the decision-making body is the teachers' body in KB, and that they are not aware of any such dissent/debate about the project, but he seems, at the same time open to an idea of a "proper" representation of the dissent before the KB teachers. The work is progressing fast at the background, and as it's a tiles-based mural proposed there, possibly the tiles are on the way, too. If we have to act, then act fast, preferably within this week. @Partho and others who are willing to give it a try: Creating a group on facebook is a good idea but since not everyone has a facebook account -- something like 'Petition Online' might be the way to go ultimately, in order to get more people to sign the petition. Once the content of a draft is ready and agreed upon by most -- a letter can be uploaded to a place like Petition Online. Everyone can then send the link to others to sign. Does anyone know how to go about setting it up? Anyone willing to start the draft? I personally don't have all the information to figure this out (willing to help with the draft however, one I have the facts). I am still in disbelief that something like this has been proposed to take place right in the heart of KB campus (literally, symbolically and in so many ways) and it has been accepted, approved or whatever ... by some people somewhere -- otherwise the tiles wouldn't be almost ready! How could this be possible? While on one hand some people are proposing to impose the local authority, SSDA or whoever, to get the building designs ratified by some hypothetical committee populated by KB top guns, while some people are hoping that being declared a heritage site would put a check on the rapid degeneration of the general ambience in the hands of the promoters and land-Mafiosi, then on the other hand KB is downplaying all hopes whatsoever in the name of "decorating" Nandalal Basu's studio! This is simply ridiculous! Or, is there a technical imposition, too? Maybe the walls are so bad now, that they can't be restored/preserved by the locally known technology - hence it's an attempt by some desperate people to hide them under a layer of tiles? (Importing preservation technologies is still something alien to VB, as we have already seen in many other cases, including Benodebehari murals at Hindi Bhavan.) Whatever is the case, the reality must transpire before any such drastic measure is taken. No, I am not conversant with "Petition Online" too, and I don't think that is really necessary - the dialogues with the 'authority' can be opened - we already have a dozen people here to sign in. If someone plans a draft, writes it down, and if 5-10 people are ready to sign it, even virtually, I can take the same to KB Principal physically. I am game! Subramanyan who has done so much to re-establish Nandalal's reputation is more qualified. @tapatiray1 (Pranabranjan Ray ? ): Sorry you feel that way. And that 'worldover' excuse, well...a lot of things are happening the world over, doesn't mean we start scaling our own values against them or try to repeat them here. We expect a more illuminating, if not critical, response from you. You are welcome to try again. We can only hope to benefit from your arguments. Thanks. "Misconceived" is a strong word - whoever uses it, and more there is no "opposition" as yet, only some people are being sad and sharing their sorrow with each other. So, in all senses of the word, the above comment is misconstrued, if not, dare I say, made-to-order. Well, in course of an introspection why people are being sad at all, let me remind myself that "Santiniketan architecture" is less of an architecture made of bricks and mortars than of being a life-style or even philosophy of simplicity. An architecture can be embellished for betterment, but when you are talking about embellishing a philosophical proposition, it would simply mean that you are rejecting the older one, you are rejecting the set of beliefs, set of convictions that lead to the manifestation in those bare walls covered with the cheapest of paints and the low-ceiling house that sits like a bird spreading its wings! I can only hope that such rejection was not what you meant! But for us, having to comply with such rejection is always painful. Mani-da is certainly the best (or worst, as he is visibly the only one) representative of Nandalal legacy, but that's not his fault and it is another issue and another debate - what happened to the rest of the legacy. Let's not get into it now. And the "worldover" stuff -- the Bamyan Buddha being demolished doesn't probably justify all Buddhas all over the world following the suit! To Pranabranjan Roy- Ur views are shocking!!! Whose Walls’ is a well written piece by Shubho Ray, who I assume from the (web) site, must be a thinking designer. This article expresses his deep passion and concern for the art and lives of both Nandalal Bose and K.G.Subramanyan. Besides, the article pokes us why we just don’t care about the original architecture by Suren Kar. And he demands a re-thinking from/by some people who could save the original architecture/studio of Nandalal Bose from an impending mural project by K.G.Subramanyan. Till then it is fine because dissent and opposition are very pivotal for any kind of cultural discourse. I appreciate till that point. But the responses to the piece have become a harvest of hitherto suppressed maliciousness with no aim, purpose or target. Suddenly most of them have found out a hero in Mastermoshai and a villain in his beloved student and willing inheritor of his legacy, K.G.Subramanyan. I smell a bit of Oedipal revenge out there; Nandalal becoming a mother and KGS, the father to be assassinated, at the right juncture, possibly without knowing the intentions of interface or confrontation. Going by the facts known to all by now, KGS did not volunteer to do this mosaic mural. He was invited by the Kala Bhavan. After much persuasion, KGS submitted a proposal, which was impermanent in nature. But Kala BhavanTeachers insisted to have a ‘permanent’ mural on the walls of Nandlal Bose’ studio. The present proposal, which interestingly with no hallmark motifs of KGS, but has a very appropriate and minimal design on the titles, was the result of this. The ‘marks’ on the walls must be a reality as KGS might not have done anything without taking proper measurements. But I should say, KGS, whom I revere for his austerity and philosophical clarity, has failed in measuring the minds of the people who have found a villain in him all of a sudden. Murals are independent works as well as embellishments. They speak of the lives, times, aesthetics and philosophy of all those who are involved in the making of it; here right from Tagore to Mastermoshai to Baij to KGS to Shubho Ray. We cannot equate the intentionalities of a muralist and a graffiti artist. Not that the latter has any philosophy but the former has confirmed to his/her directives keeping his philosophy as the final guiding principle. Hence, we cannot call Benode Behari Mukherjee and KGS as graffiti makers who vandalized the architecture of Santiniketan. Shubo does not intend to say so. But the commentators are unknowingly doing it for themselves, to which eventually, unlike his original article, Shubho too plays up. We also forget that Mastermoshai was one master worthy of his qualification took his students to copy Ajanta Murals. He wouldn’t have objected this project had he been alive to see his disciple doing it. Unfortunately we have shot the messenger. The commentators have found another ‘old school’ critic there to wreck their revenge upon. Let us not shoot KGS again. Let us train our guns to the ones who have cajoled people into it as a ‘cover’ up project. If KGS was forced to do that by some people without letting him know that they were intending a cover up job by the artist than a mural. Let us track down the people who were (have been) responsible for the rotting of this building. Let us find out those people who could not lobby long years back to make it a heritage building. KGS is not an artist with no consequence. KGS is not a conspirator. KGS is not an artist would look for vain glory of having done ‘one more’ mural. KGS is not an artist would pilfer a few lakhs from some organization in the name of a ‘project’. In my eyes, KGS is a swan who flies along with the flock that comprises of similar winged souls like Tagore, Nandalal Bose, BB Mukherjee, Ram Kinkar Baij and so on. I would request each and every commentator in the blog to read ‘Letters’ by KGS published by Seagull, Kolkata. After reading those letters, if you still feel like stoning him down with covert words, you may do so. My request to you is this; before starting a facebook campaign, before becoming presidents, secretaries and treasurers of such online platforms, please direct the debate to the right direction. Finding a scapegoat in KGS would help only to boost our provisional pride to some inches. Nothing more, nothing less. This blog is not showing the paragraph division, some how. I tried para division and posted again but it appears without space between para. @Johnny ML, to start with, sorry for the paragraph thing. Yes, it needs to be looked upon :) and thanks, double-thanks, for your wonderful comment, which has indeed enriched the ongoing discussion. You appear to be a ‘thinking art historian’, if I may return the favour :) Sadly, only a small slice of the ongoing discussion is visible here on this blog, and I think from the early days of ‘villainizing’ KGS, this discussion has moved on, as unfolded in emails, phone calls, informal discussions, addas...But yes, you have every right to judge the whole affair from this blog, since your rejoinder is as much about the KGS mural as it is about this article. So yeah...But tell, Johnny, exactly which of my comments seem to be playing up to the ‘villainizing’ of KGS (if there is a word like that, ‘villainizing’...excuse my English)? Could you quote one, for my convenience? I am surprised you think so, as I have been careful enough not to tread into that territory, as I don’t wish to play Cassius here (speaking of rhetoric, hmmm...yeah...and Ides of March :( Thankfully today is 14th: I don’t like such nasty coincidences ). I am still as divided about these matters as my article tried to suggest...though going by my emotional drive, I am still against the ‘project’. I suggested to open a Facebook page precisely because I wanted the discussion to take place somewhere else, as I don’t want to be remembered as someone who villainized KGS. And yes, I meant ‘discussion’. Please check my comments again. In regard to my comments, I think I stayed as neutral as possible, not trying to shepherd opinions, and only responding when I felt it necessary, or felt clear about it in my mind. In fact, KGS remains an inspiration to me, which I think should be crystal. But you see, artists (and bloggers too) do things, and often they don’t realize the implications their work bears, engrossed as they can be...pearled up in their shell of creativity, forgetting to take minor issues into account. And good that there are people who take to raise discussions. Like you did, reminding me here. Thanks for that. As far as your comments about KGS not intending to do this mural, I have been informed otherwise: I hear KGS proposed to do a mural on these very walls somewhere in the 1980s (1983, if sources are to be taken seriously), but then somehow it didn’t happen. But it stayed there, somewhere at the back of his mind maybe(? my guess...), only resurfacing once requested again by the current administration. So yeah...But somehow, I don’t personally feel there’s a ‘cover-up’ of any sorts. That’s an easy conclusion and again, another form of villainzing. So please don’t play up to it now before investigating about it. But I like the fact that people are looking at it from all directions, which is healthy. I think simply, people are too glad that KGS has agreed to do a mural again, feeling sort of grateful about it, and are only too happy to oblige. This I personally find slightly disturbing: which was why I wanted to pour the various thoughts troubling me and harbour them in this article. The only point I would flatly disagree with you on, is that I have recently seen the model of the project, and I am not personally impressed :( But it’s a personal matter, and one should be open about that. I just don’t like the ‘resort-like’ feel to the whole thing...But that’s just me and my confused sense of aesthetic. But I can understand where you are coming from. So I don’t expect you to feel the same about it. You see, I grew up here. So obviously, I see it differently. Maybe a tad more attached than necessary? But personally, when weighing the options in my mind, I find the building without the mural to be more soothing a thought than the building with it. Thanks again for commenting. Interestingly, the whole discussion has shifted focus from where it should be, that is the "Santiniketan Architecture" (if something like that ever existed). I wonder how it has turned into a blame game. Shooting KGS, or "villainizing" him, was never the purpose of this whole thread as I understood. Whoever had invented this idea of blaming KGS, and subsequently someone else (old/new school) jumping in to defend, was taking a hyper-reactive stance at the very outset. 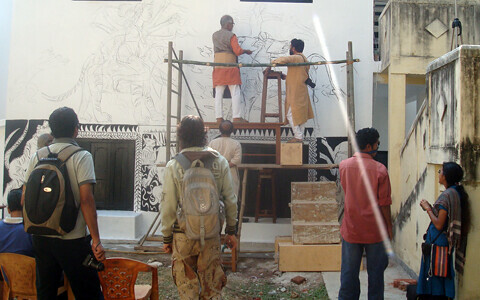 Another KGS mural in Santiniketan would be a blessing, and is most welcome, but the question is, where? Secondly, 'cover-up' project was my speculation initially, and anybody who had ever dealt with this varsity would know that there are enough reasons to be sceptic on that front, but let me mention again, that it was and still is a secondary possibility only, even tertiary, and rightly was put across as a passing hint. @JML: banging one's head on the conspiracy theory would yield nothing, for had there been an 'investigation' really, KGS would have been a party to it as he himself held important official positions here for three long decades or more. As the only visible mantle-bearer of the Nandalal legacy, onus also lied on him to see to it that the essence was preserved. And about finding a hero in Nandalal or Tagore for that matter, true, why would the founder of an institution be a hero there? Martyrdom is reserved for them who misappropriate it! @Shubho..thanks for that carefully worded reply. I am happy that the discussion has come back to the track perhaps laid by you in the article. Villainizing of KGS was obviously not by you and I never said so either in my comment. What I said is that the 'commentators', knowingly or unknowingly have brought it in their comments. Please do read the initial comments carefully. KGS had spent three decades there and he, as per your research, had expressed his interest to do this mural. You may understand the enthusiasm within that context. But after almost three decades, when he gets an invitation from the Kala Bhavan, I don't think he ever need to take it as an ethical issue because as you said, this idea has always been there in him! As far as an artist is concerned, when his intentions are clear and conscience is absolutely guiltless, why should he think that he is doing injustice to his master's legacy. Had he been an artist of my generation, I would have obviously thought along your lines because we are not KGS. Interpolations are validated and authorized in certain contexts provided the interpolations boost of the critical readings of the existing ones. For example, when Santal Family of Baij was taken as a central motif by Grant Watson and Anshuman Das Gupta we did not accuse them of either iconoclasm or vandalism as we thought it would re-read Baij in a renewed context. Here, the mural(istic) interface by KGS is not even an interpolation, but a value addition to the existing body. Being puristic about the architecture is absolutely the prerogative of an individual or of a collective. We had witnessed it in 1992 December. However, I appreciate the emotional urgency in your words. I respect it. My non-membership to the Bengali community in fact does not divest me of expressing my sentiments vis-a-vis this debate. The cover-up and conspiracy theory was not mine. If you read between lines amongst the comments, you could deduce the same. @ Parthapratim... you have already answered your doubts. Before I entered in this debate, if you read the comments carefully, the debate had gone off the tracks. I was actually not banging my head instead I was harking the whispering behind the stone walls created out of those comments. Then about martyrdom. You re-read that statement of yours and try to tell yourself you have gone absolutely wrong in it. I don't expect a war of words, which I am very good at. Please discuss the core issues. And Shubho may write another article summing up the debates over mails and phone calls, which we are not privy to know. I must admit that I am neither an art historian or an art critic. I chanced upon this blog and thought that it was important to put down my thoughts. While there is detailed reasoning why an important building at kala bhavan should not be 'tampered'with, has anyone given a thought to what has happened to Shantiniketan and more importantly to Kala Bhavan in the past years? I visit Shantiniketan every year, to soak in the art and history of the the region and with each passing year, my interest to go back diminishes. The very sad deterioration of the place, poor upkeep of the wonderful pieces of art and the general lack of cleanliness and order is heart wrenching. Here is a legend trying to give back to Kala Bhavan and we decide that it's wrong. So the best thing to do is launch a campaign to malign his efforts. For heaven's sake are there not more important things that you can highlight that will contribute to Shantiniketan's good? You are looking at the tree and have lost complete sight of the forest. I will be very happy if you can use your blog and galvanize the past and present students of Kala Bhavan to come and give ideas and contribute to the resurrection of Gurudev's dream. @ sanjay... have you actually 'read' the main article and the subsequent discussion? i think you have missed the entire point. and, to preserve the forest you have to tend to individual trees as well. @proiti...Look at the big picture. And anyway I hope the people who are taking such lofty idealistic views are doing something for Kala Bhavan. We have long suffered from too much intellectual talk and no action. @Sanjay: you got an all wrong clue about Santiniketan, "all talks and no action" was never the trend here till date, rather we have suffered from the exact opposite. Everybody ACTS in his/her own way, without getting into any dialogues synchronically or diachronically. Hence there is no lateral, or vertical integration between the actions, and the obvious fall out is chaos, which transpires to YOU as degradation/degeneration. The chaos/turbulence itself has distanced the reality from the ideals. What big picture you are showing dear friend? Is it any bigger than Tagore's original vision based on simplicity, and his gorgeous minimalism based on the Nature's lessons? Here comes the basic contradiction. Whoever are taking important decisions now or are pretending to, and also the people who are insisting on supporting the furtherance of the chaos, have successfully distanced themselves from the core idea of Santiniketan that was penned down 100 years back but are actually dated in the future. I for one, just want to stop and review scrupulously before I do anything that I'd regret 50 years later. @JML: Thanks for your advise/suggestions/imperative about re-reading, however this is to inform you Sir that they are summarily rejected. You are yet to reach the core issue here. Ideas and precedences are translated into hard reality in many random ways, and you have to be an insider of the local history to get an account of the devastating possibilities. Writing a commentary on history is not a game for the fans or fanatics. Mani-da is a great artist, and possibly THE greatest commentator of his time and space, we all adore him for being so, but his actions too are answerable to the HISTORY in all CAPS!! I am in full agreement with the writer that even the stick-no-bill walls are not to be left alone -- as the world -- or even nature -- has a palimpsestic way of treating every surface. As for Subramanian, he can also be allowed to put his signature coat on the an iconic (or should one use the word non-iconic as a homage to the horizontal/organic process that it priviledges) structure built in the spirit that once presided over Santiniketan. With all due respect to its original maker, Mr Kar, I feel that when an architecture is subject to changes -- we lets it it aspire to a palimpsest where the content keeps changing and becomes a repository of historical developments from various phases. @Shubho... I have nothing personal against anyone of you. You seem to be taking pot shots at me. I do not have a problem with that. I am not here to 'redeem the world' just to make the participants here aware of the bigger picture. I will be the happiest person if you are contributing to the development and glory of Shantiniketan (even if it is in a minuscule way). @Mr.Parthapratim, your rejection or acceptance does not matter much to me. This insider-outsider game is too childish. And you are the only person in the whole discussion who is instrumental in derailing it with this sort of aggression. @ Shubho, I also don't know Mr.Sanjay. However, I would say in a public debate like this we need not be too specific about one's qualification on the subject. We all assume that we know each other and respect each other as the art scene in India is too small. But when someone involves in a discussion we cannot ask him/her about the lineage, educational qualification and so on. If so an 'outsider' like me should ask who are all those people who have commented/involved in this discussion. Except for Mr.Pranabranjan Ray and Indrapramit, I have not heard of anyone else. Dear Shubho, did you notice the 'core issue' you have raised in the article has vanished by now and in its place what we see today are the issues of 'who is an insider who is an outsider', 'we know the internal politics than you', 'we have been seeing it for long', 'you don't understand' and so on (refer Parthapratim's words). For Tagore's sake (not as a Bengali but as an international literary figure and philosopher) let us keep our aggression and ego under check and address the 'core issue' (now is that Suren Kar's architecture, Nandlal's studio or KGS' mural?). THE BAD OMEN ----------------------------------------@JML: Now it transpires to me that you are simply incapable of understanding what Shubho and me are talking about, and you have started coming down with the usual silly tricks of twisting one's words (I said "insider of history" vis-a-vis "insider of Santiniketan"). However, it's easy to find me on Internet, on Youtube, on IMDB, on Blogspot, on R.M.I.C. even on Facebook as it was very easy for me to find your words that read "I am ready to die/get killed for keeping the revolutionary spirit of art intact" on artindia.net. You claimed earlier that you are very good at war of words, now let's review what your words contained there. First came your theory of Oedipal revenge (Oedipus has been your recent fad, I can see that) where you placed Nandalal at the mother's throne while KGS being symbolized by the patriarchal omen (err, what?? :D)! Then you went on speculating that Nandalal would have encouraged the "mural(istic)" (sic) endeavour that according to you is actually a value-addition (does VAT apply?) to the original, and then you keep blaming me and others who subscribe to the dissent that they are vandalizing the "discourse" (with a wrong meaning of the word, to my mind, known as catachresis) by aggression; while you are the one who implanted the divide in the thread for the first time with your not-so-subdued bitterness for the imaginary anti-KGS campaign that you might have hallucinated about. Fact remains, none of the commentators here are anti-KGS, they all are direct students and/or ardent followers of the great man fondly referred to as Mani-da, BUT all they want is a DEMOCRATIC STOP-REVIEW-GO kind of intervention before we go on tampering history. If you find me aggressive there, you are quite right, but in fact you are barking up the wrong tree, you are equating "calling a spade" with "calling names" and you are inventing history in your comments. Stop being on your high horses, be my guest, and know the real context before you theorize out of nothing. ---------------------THE CORE ISSUES ------------------------------------------ Whatever the art-critics (or self-styled ones) say, the core issue remains that how to preserve the historical monuments in Santiniketan, whether the minimalism there is also to be preserved or we can allow the utterly evident rejection of Tagorean minimalist philosophy and its manifestations (and embellish the same), and whether a democratic intervention is needed before we decide to change the form and content of Santiniketan. My vote goes to "preservation as-is-where-is", being a bit stubborn actually helps in the given context. I am not going with a Premature Revolutionary Spirit. The moot point is whether this particular building is considered to be a heritage one by Santiniketan or not. If it is considered to be of heritage status then its walls should not be tampered with however good the intention may be. On the other hand if the authority do not think that it is a heritage building; then anything can be done on this- even the building can be demolished. It will be good to look into Visva Bharati University document related to 'Heritage' status attached to different buildings of Santiniketan; like the Sinha Sadan , Dwija Biram etc which has been/ is being restored by Archeological Survey of India. If it is not in the heritage list - then to prevent any new artistic face-lift the building should be declared a heritage one. Personally I feel the building should have been tagged a heritage one; it is certainly an expression of the Santiniketan Style of Architechture. Heritage is NOT a matter of some "official" list, rather it's a matter of the cultural praxis. 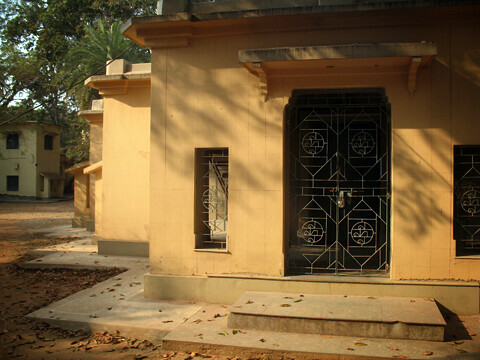 The building is unmistakably located in the map and the public psyche as "Mastermoshai's Studio" -- Mastermoshai Nandalal Bose being one among the most revered personalities and the mainstay of all that is Santiniketan. If this is not heritage, then what is? Not acceptable the decorating part. it Should be stopped. I have just seen the progress of this work under taken by KG. I have photographed also. I totaly agree with those comments above. I have much regards for KG's work. But this is not. Why he is doing this I wonder! Can anybody stop it. absokutely, whose wall is this. Sure it is not KGs. Stopping this would take a PIL (Public Interest Litigation) and nothing less, but we need to form a group of citizens first to launch the process of suing them. Any takers? very sad. why r general ppl in india so ignorant abt their past & heritage? this is vandalism on d walls, only in d name of art. its like destroying someones shrine 2 build ur own. beutiful it may be. still its vandalism only. ppl plz spread awareness. plz. Hi I came across this article today, and i realised that thia was written before the tiled mural of master moshais studio was in fact started. I also realise that the author of this article fears the defacing of the aforementioned studio by what he calls " Colored Tiles". I would ask the author if he has infact seen the said studio after the work was completed and whether he does not think that a follow up article may be necessary. As far as I understand, as a Kala Bhavana alumni, as well as a Santiniketan resident, the tiled mural has infact blended into the atmosphere of the santiniketan architecture and natural vista as seamlesslessly as the original house itself. Dear Uma, your comment prompts me to believe you perhaps didn’t read my article. I’ll just cut to chase and point out that the chief problem with the mural was that it was being done on another work of art. Like someone commented earlier, “it’s like destroying someone’s shrine to build your own”. I am stopping short of expressing how pretty I find the job because I want to spare the master some wrong adjectives. I don’t know what the artist himself thinks of it today. But while this gesture was un-preceded by thought & un-accompanied by conscience, I hope it is not un-followed by remorse. And I don’t think “blending” is the only aesthetic criterion here. Hideous camouflage prints do the same more effectively. Question is, how relevant is it? Is it more relevant today than what it replaced? From how it stands today in Santiniketan, do we need decoration, or preservation? yes a follow up article might be necessary as the sight of the discussed about architecture over these times have proved that the skepticism reflected in "Whose Walls are These?" bear a genuine concern and points on rights and aesthetics in our daily life . i think it was or it is not just a point with the tiles or looking good(that also can be questioned if you minutely compare the 'handwriting' on the tiles with the 'calligraphy' of the text that is copied and also other qualities and characters). the make-over has somehow corrupted the structure of the architecture that had been important from the context of the modern architecture movement in/of shantiniketan.if one studies the ground plan,elevations i.e. the geometry of the old architecture and those of this newfangled building,even if not taking into account the roles of the sun & light on it and other things like those mentioned earlier in "Whose Walls are These?" one would understand why and how things are going very wrong with our shantiniketan,kalabhavan and the taste of the place and people. one will find similar eyesores in the other renovated works like CHOITI or the environmental sculptures by RAMKINKAR all over the small place. yes you can assure me that all things in shantiniketan are perfectly blended at present.we are happily allowing walls barring our common-sense and the simple-seeing. i remember Manida once commented on his contributions in nandan mela:"Mani,Mani..but where are all this(sic.) Money going?" so old people used to say : SHADHU SHABDHAN! cheer up dudes.things are bad and we should realize that.